At our website, group travellers can book diverse types of vehicles with operator. In confirmity with the required number of seats, our company is eager to help you charter street vehicles of all sizes for your ride in Bavaria. We and our partner bus companies invite you to opt from the different bus sorts. Whatever choice you make, the team of City Tours Europe can ascertain to deploy suitable street vehicles from Bavaria for your transfers. Motorcars with operator in Bavaria: If you want to rent a private car, an oldtimer motorcar, or a luxury limousine, our company can rent you out cars with regular seat number with a driver within the borders of Bavaria. Moreover, we can also take you to Baden-Württemberg, Hesse, Thuringia, Saxony, Czech Republic, as well as to all communities, cities and regions of Germany. Minibuses and midibuses with driver in Bavaria: For travel itineraries of medium-sized groups of tourists, we can offer tiny and small buses with driver in Bavaria. Of course, our vehicles can also be hired for a tour to Austria, to Czech Republic, to Poland, to France, to Switzerland, and in entire Europe. 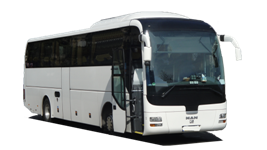 Big buses with operator in Bavaria: For large traveller groups, we can help you book large-sized buses as well as double-decker motorcoaches with motorist for transfers and tours within Bavaria and all around Germany. Of course, your passengers can order our modern buses for long-distance rides outside the frontiers of Germany, for example to the closeby countries of Poland, Czech Republic, Austria, France, and Switzerland, or to other countries of Europe. Bus hire in Bavaria and in Germany.
. If you want a quick answer, please give us these core data in your itinerary description: number of persons to be transported, starting and ending point, preferred route, starting and ending time. With these specifications, we will rapidly send you a quotation for your bus travel in Germany and entire Europe.